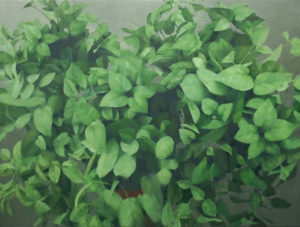 James Harris Gallery | Eric Elliott, "Overgrown"
James Harris Gallery is pleased to present Overgrown, the fifth solo exhibition by Seattle artist Eric Elliott. For this exhibition, Elliott presents a selection of two paintings and two large-scale drawings. While Elliott’s botanical obsessions provide a sort of constant to his practice over the years, his process has continued to evolve with his own understanding of perception. Acutely aware of a phenomenological relationship to his subject matter, Elliott’s work is as much about light and atmosphere as it is about the awareness of his own artistic filter. In his ongoing dedication to a realist abstraction, Elliott’s new work explores this subjectivity to collapse the visual cues of observational painting and create a direct and candid experience of the abstract beauty in the world around us. In the past, Elliott’s work began with an idea, and in his scientific way, Elliott methodically employed painterly techniques to render these concepts on visual terms. After some time rethinking this cerebral approach to image making, Elliott’s has taken a far more experiential turn to his process, abandoning preconceptions and allowing for his own experience of the world to directly inform his work. 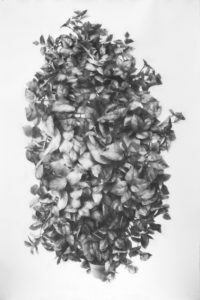 The result is honest and unfettered, no longer confined to subject matter, structure, and scale, this approach allows for ever-expanding monster sized plant drawings that eerily seem to posses human like qualities and emotion. 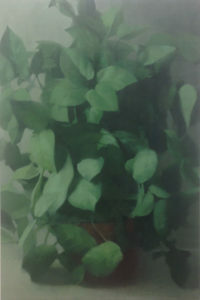 In his new paintings, Elliott abandons a single outside perspective to immerse himself in his subject, depicting the plant as a sea of leaves from an intimate vantage point. He offers a more complete experience of subject matter in this sense, true to the artist’s own discovery of form, space and light. In these works, Elliott returns to a more accurate treatment of color, informed more by this sense of light than the object itself where the variegated shades of green dissolve into dark and light. The palpable relationship between artist and subject is present in a way that offers an almost hyperrealist quality to the work. This relational treatment of abstraction reveals absolutes and pure form, an essence only intelligible through the perceptual clarity of experience. The shifting scale from the large work on paper to the adjacent smaller scale paintings is purposeful, and reveals glimpses into Elliott’s mind and his relationship to his subject. 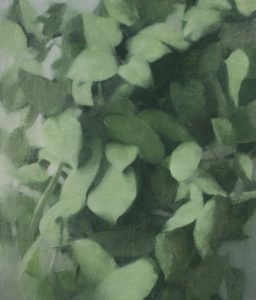 “Overgrown” not only demonstrates the importance of this synergy between drawing and painting but also of the development in Elliott’s artistic process. 78" x 50" x 8 1/8"